The Stirling Staffman’s life seems like an easy one. He was promised free food, drink, lodging and the tools of his trade were provided at the Burgh’s expense. 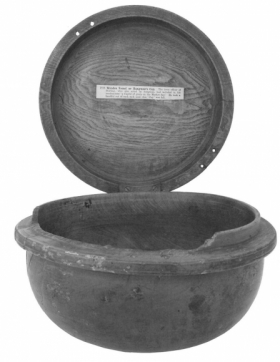 Presenting his 'Staffman's Caup' (pictured below - the only Staffman artefact remaining, preserved by the Stirling Smith Art Gallery and Museum) at any shop guaranteed him a measure of grain, flour, oats, wine or whisky. Aside from his monthly wage he was paid for every punishment, be it a hanging, whipping (scourging, as it was known), branding or ‘lugging’ (nailing a villain’s ear to the Mercat Cross and leaving them to tear themselves free). There was, of course, a catch. His home at Hangman’s Close was, as one local historian put it, ‘a mere apology for a human habitation, many a stable in the town being said to be more comfortable’. Worse, the office of Staffman was a life-time appointment: the executioner was bound to serve the Burgh until his dying day, and could not even leave the town without first gaining permission from the Provost. Only death or dismissal could free him from his contract. Also, if there were no executions, whippings or sundry punishments to occupy his time the Staffman was to be gainfully employed in sweeping the streets. Stirling’s most famous Staffman, Jock Rankin (or Rankine – even he, barely literate, struggled to spell his own name the same way twice! ), was the son of an Ayrshire executioner. Details of his life are sketchy. We don’t know when, exactly he was born, or when he took up the post of Staffman in the Royal Burgh of Stirling. 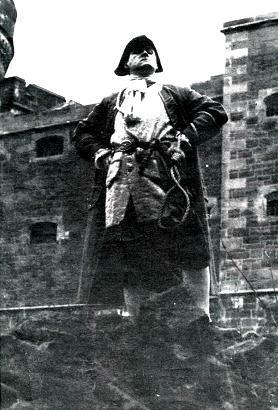 Much of Jock Rankine’s enduring legacy – the inspiration for his appearances on the Stirling GhostWalk since 1989 and, from 1996-2012, at the Stirling Old Town Jail – relies upon the popularity of William Drysdale’s Victorian histories of the Burgh, ‘Old Places, Old Faces & Old Stories of Stirling’ (1896). According to Drysdale Rankin was an exceptional Staffman...exceptionally bad, that is. ‘more frequently found, and…in greater number, in the neighbourhood of Jock’s do than of any other of the inhabitants, the spirit of mischief leading [them] to devote more of their time and attention to him, in the hope of greater sport being obtained by reason of his eccentricity’. In the winter of 1760 Jock called upon a peculiar and rarely invoked privilege due to the Staffman. He requested that the Burgh find him a wife. This they duly did, in the form of Irish thief and streetwalker, Isabella Kilconquhar, known – because locals couldn’t understand her thick Irish brogue – as ‘Tibbie Cawker’ The whole town turned out in merry mood as the Happy Hangman and his bride-to-be were marched to the Mercat Cross by four halberd-bearing Town Officers in full regalia. The kail-runts had planned their own cheeky celebration of the Staffman’s nuptials. As the newlyweds snuggled down together, the brats heaped as much horse-manure as they could carry from the stables below around the entrance to Hangman’s Close, leaving it to harden in the cold night air - requiring Jock and Tibbie to exit via their first floor window, next morning. A hangman choking to death? A dish laden with a wee dash too much of dramatic irony. According to William, Tibbie returned to the Close just in time to witness her husband’s passing: ‘with exemplary affection and tenderness [she] tended him in his last moments, and did her utmost to alleviate his sufferings’ (though there is a suggestion that Tib dropped the bone into her husband’s broth in order to finish him off...naughty girl). So how did Jack Rankin’s story become one of the Old Town’s most famous ghostly tales? In the mid 19th-century the Staffman’s lodging, Hangman’s Close had fallen further into ruin, and was used as a Night Shelter for drunkards and vagrants. The alleyway beside it also led to the warehouse of a local brewery. This, in the opinion of local parents, was just too much temptation for the local brats...and they devised a plan. Drawing on Drysdale’s colourfully comic accounts of Jock and Tibbie’s riotous romance, they warned their offspring to avoidthe gloomy high-walled huddle of Hangman’s Close...lest they be set upon by Rankin’s wraith – his spectre’s oft-reported gagging growl explained away as an eternal effort to dislodge the fatal fowl-bone from his ghoulish gullet . Sure enough, those bairns brave enough to venture near that dismal dive would hear the promised muttering and spluttering, and flee...unaware that it came not from the wraith of the terrible torturer, but from the beggars, tramps and sundry wastrels sheltering there. Jock (and Tibbie, on occasion) remains a popular part of the Stirling GhostWalk – an enduring reminder that, as we are so fond of telling visitors to the show, you should never let a little thing like he truth get in the way of a good story.